How to Clean Your Jewelry at Home! 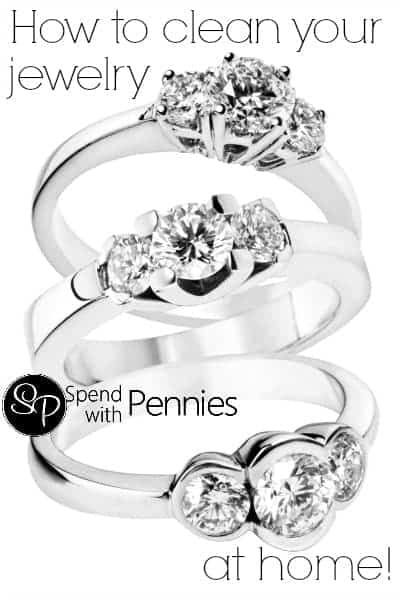 Follow Spend With Pennies on Pinterest for more great idea, tips and recipes! Keeping your precious jewelry clean and well-preserved usually means a trip to the jewelry store. While you should get your jeweler to check your valuables every 6 months to a year, to make sure your settings are not getting loose, you don’t have to buy jewelry store’s expensive jewelry cleaning kits. Make your own at home! Cleaning your diamond rings: If you have a ring with a precious jewel setting, there are a few things you can do at home to keep it in top shape. Grab a bottle of Windex and toothbrush. Dip the toothbrush into the Windex and gently scrub the surfaces of your ring. The glass cleaner will shine your gemstones and the precious metal of your jewelry without damaging them. No more tarnish: Your old silver pieces looking a little worse for wear? 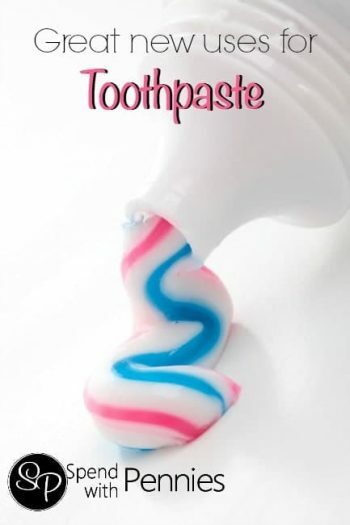 Use toothpaste to remove all that nasty tarish! Grab a toothbrush with soft bristles and some white, plain toothpaste. Wet the toothbrush just a little, then rub the toothpaste right into the silver. The baking soda in the toothpaste will remove the tarnish and your jewelry back to the way it was! Plop, plop, fizz, fizz: Alka-Seltzer is a great jewelry cleaner; just drop a couple of tabs into some water, and then, once they are mostly dissolved, drop in your jewelry. The fizzing action of the Alka-Seltzer tabs will help to clean your jewelry with no scrubbing on your part! Clean your pearls: Pearls require special attention. You can clean pearls with a teaspoon of Woolite mixed with 1 quart of water. Just drop your pearls into the mixture and after a few seconds, pull them out and towel them off with a cotton cloth. But the best way to clean your pearls is to wear them! The oils from your skin will polish them and keep them shiny and new looking! Porous stones: If you have a porous stone, like turquoise, never submerge it in any kind of cleaner! Just running a little hot, soapy water over the stone, then immediately buffing it dry with a very soft cotton cloth, will be enough to keep these clean. Tungston Carbine: While marketed as undamageable, some harsh chemicals and UV lights can damage this super hard metal. Make sure only to wash this type of jewelry with mild soap and care. Also, never store your tungsten jewelry with diamonds, as they can scratch them! Thanks for sharing this amazing info ! Do you think cleaner machine can help for this without scratching the jewelry? I haven’t tried it so I can’t say for sure how it would work. I do believe that toothpaste can remove the tarnish but will it scratch the jewelry? I got some name necklaces including engraved necklace in my jewelry box, I bought them on this web last year. I wear one of it ever time I shower, it got some tarnish now, I am looking for a way to clean it. John, I can’t say for sure, as it depends on your specific jewelry and the brush you use. I’ve had success with the cleaning! I love the toothpaste tip for getting rid of tarnish! It’s the worst when your beautiful jewelry starts to look dull and less attractive. I found the article that has tips for preventing the tarnish buildup and helped me keep my jewelry in pristine condition http://www.diamond-banc.com/six-ways-prevent-jewelry-tarnishing/ , Check it out and save some of the time that wouldve gone to cleaning jewelry on something else!